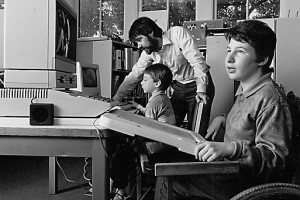 In 1983, a group of visionary parents came together to found an agency that assisted families and individuals in determining how people with disabilities could access computers. One of those parents, Jackie Brand, became the first Executive Director of what was then called "The Disabled Children's Computer Group". 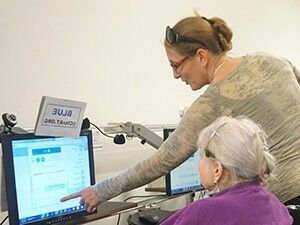 DCCG was started to enable information on assistive technology, then a brand new field, to be distributed to people who were trying to see if personal computers could be usable by people with disabilities. DCCG quickly enlarged its scope, and began working with both children and adults. The name was changed to the Center for Accessible Technology to reflect this broader range of clients. CforAT also inspired other similar organizations to start across the country, and at one time there was a network of almost 40 AT Centers. In 2001, the focus of the organization began shifting. Although direct service to children and adults with disabilities was still a major focus, we begin developing more business to business consulting services. Those services included website accessibility consultation, the development of a Test Bank of users with disabilities, and providing product testing for both online services as well as handheld electronics. 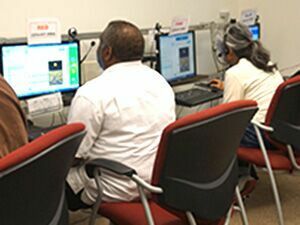 In 2010, CforAT developed a national/international project, the AT Coalition that continues to provide both an online resources on accessible technology as well as webinars on various AT-related topics. In 2011, CforAT began its involvement in statewide policy that affects people with disabilities by representing the disability community in proceedings at the California Public Utilities Commission. CforAT's input is also used in various proceedings of the Federal Communications Commission. In addition to our traditional direct service work, CforAT developed the first lending library of iPads in California. These iPads are loaded with software that make them usable as communication devices by people with speech disabilities, and also can be used in many other ways to accommodate people with disabilities. CforAT continues to monitor trends in technology and how people with disabilities use emerging devices and services.